First Sergeant James Mills of the Buffalo Soldiers Heritage Association (BSHA) believes in the power of keeping history alive. "We represent the past," he says, sitting in the wood-paneled office of a century-old Detroit barn that serves as the BSHA headquarters. "History has shorted us as African Americans." Together with other members of his organization, Sgt. Mills works to reclaim the stories of a group of African-American soldiers, known as the Buffalo Soldiers, who began their service with the U.S. military on the country's western frontier in the years following the Civil War. 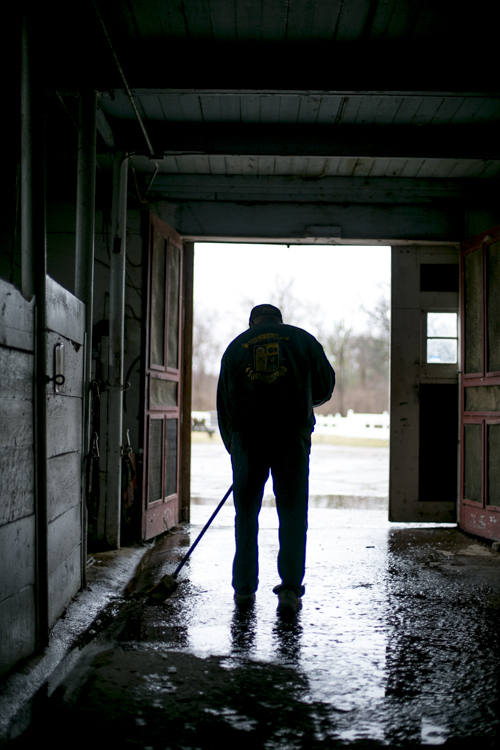 James Mills clears a puddle from the BHSA barn. In 1866, responding to an act of Congress, the U.S. Army formed six regiments composed entirely of black soldiers: the 9th and 10th Cavalry; and the 38th, 39th, 40th, and 41st Infantry Divisions. Many of the original servicemen in these units had formerly been enslaved or had fought in the U.S. Civil War. Buffalo Soldiers regiments served for eight decades, patrolling the border, protecting settlers and working on infrastructure projects, as well as fighting in the Philippine-American and Spanish-American Wars and World Wars I and II. During their early years, the 10th Cavalry frequently clashed with Native Americans of the Great Plains, including the Cheyenne who gave them the nickname Buffalo Soldiers. Later the term was used to refer to all African-American units. Many of these servicemen were highly decorated; during their early years on the western frontier, 18 of them won Medals of Honor and 12 received Certificates of Merit. Ultimately, though, all active Buffalo Soldier divisions disbanded during the Korean War era, as a result of President Truman desegregating the U.S. Armed Forces. "The Buffalo Soldiers had a significant impact on our country without the recognition [of the public]," says Sgt. Mills. "Getting the job done without the recognition, racism thrown on you, but you still achieve at high levels, that's what I learned [of their experiences]." 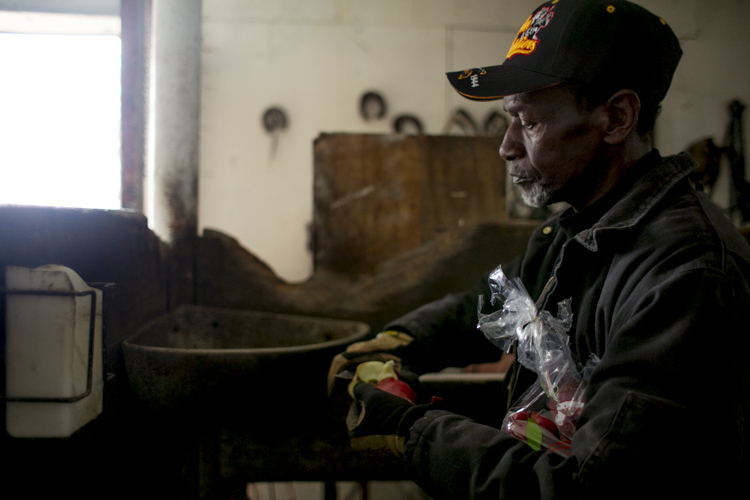 In 2006 an informal group of horse enthusiasts from around Metro Detroit took over an abandoned stable at Rouge Park and adopted the Buffalo Soldiers mantel, resurrecting these servicemen's overlooked history. Today the Buffalo Soldiers Heritage Center serves as a place where visitors can learn about the story of these military men through lectures and reenactments, tour the stables, and groom and ride horses. The idea for what became the Buffalo Soldier Heritage Center actually got kicked off at a horse ranch in Windsor, Canada called the Broken Wheel. "Everybody used to go over there to ride," says Sgt. Mills. One day in 2005, the ranch’s owner exclaimed to future founding BSHA member Bob Jarber, "You look like a Buffalo Soldier!" He was covered in dust after a long day of riding. "It escalated from there," says Mills. "They asked, ‘What’s a Buffalo Soldier?’ No one knew the history." With his interest piqued, Mr. Jarber started researching the group. Soon an informal group of friends started gathering period-specific weapons, commissioning uniforms, and approaching the city of Detroit about taking over the stables. Through this initiative, The Buffalo Soldier Heritage Association was born. The late 19th-century barn that houses the association is nestled in a quiet corner of Rouge Park. The facility had housed the Detroit Police Department’s Mounted Unit until its disbanding in 2005. Now it holds eight horses that live there year-round. Two barn cats, the affectionate Ceasar and skittish Bob, are tenants there too. And hawks and blue jays are also regular attractions, as is a family of coyotes frequently visit from the nearby hills. Inside the barn, photos of the BSHA line the walls. There are pictures with former Mayor Dennis Archer, news clippings of the group, statuaries of the 9th and 10th Cavalry soldiers, and posters celebrating Buffalo Soldiers throughout history. These are just some of the many mementos that cover every inch of the center. During the group's heyday in the late 2000s, BSHA members were staples of local parades and events. Some traveled to Atlanta, Washington DC, and even accompanied former four-star general Colin Powell during a Buffalo Soldier monument dedication ceremony in Fort Leavenworth, Kansas. These days they tend to stick closer to home. As the original members of the group began to pass away, Sgt. Mills and the others enthusiasm for the chilly 5 a.m. show-up time for Detroit’s annual Thanksgiving parade became less appealing. But today three core members and nine regular volunteers are still keeping the organization active at Rouge Park. The center continues to stand as a monument to the men who served as Buffalo Soldiers and regularly educates children from Detroit and its suburbs, as well as those from as far away as Canada. The story of how Sgt. Mills got involved with the Buffalo Soldiers Heritage Association actually goes back a while. He's a person who found a bond with horses early in life. Growing up in Detroit’s North End in the 1950s didn’t allow a lot of access to equestrian experiences. But a neighbor of his, a man named Sam Cobb, kept palomino show horses in a garage he'd converted into stables. Impressed by the animals’ intelligence and unpredictableness, nine-year-old Mills worked his way into a job cleaning the stables. But even as the US military began to desegregate, ending the all-black Buffalo Soldiers units, Cobb couldn’t display his own horses in competitions. Sgt. James Mills interacts with a horse. "He couldn’t show them. So he hired two white girls to show the horses for him," Sgt. Mills says, noting that, despite winning numerous awards, Cobb's ownership remained a closely guarded secret. "He was a black man in a white man’s world." As a teenager, Sgt. Mills got a job as a hired hand on a ranch in Warren, still largely farmland back then. During the summers, he'd ride a bike there from the North End and spend weekends saddling horses and retrieving animals lost by inexperienced tourists. At age 25, after a six-year stint in the Army, he returned to Detroit and bought his first horse, a stallion. That ended up being a little too much to handle; after a year, he gave it up, choosing to concentrate on raising his two children and focus on his job as a biomedical engineer. It was two decades before he bought another one, a quarter-horse named Eros. "You couldn’t ask for a better animal," he says of Eros, who recently passed away at 35, a ripe old age for a horse. Today Sgt. Mills owns two horses. He's usually at the BSHA center seven days a week, which includes stopping by for 5 a.m. feedings on his way to his airport shuttle driver job. And that's just the way he likes it. "If there was an eighth day in the week, I’d be here," says Sgt. Mills. Elroy Reese cuts an apple.youth. "My dad had horses, and my neighbors had horses — I grew up around horses," he says. In 1971 he came to Detroit looking for work at an auto factory. Although Reese soon got a job at the Chrysler Stamping Plant in Warren, he quickly realized he hated that line of work. In 1977 after six years at the plant, he decided to join the Detroit Police Department. Now he sees working with the BSHA as another chance to serve the community. "I’m here to help," he says. "When the kids come here, they open up to asking questions … You gotta give them the best and most honest answers." Mr. Reese sees his group as an informal park patrol. People walking aggressive dogs without leashes — a violation of park rules — are a big concern of his, and he's spoken to the Friends of Rouge Park about making BHSA volunteers official park rangers. This is in keeping with legacy the Buffalo Soldiers, who served as some of the original enforcement officers in the National Parks. Reese envisions the BSHA being a regular patrol that calls the DPD when they encounter wrongdoing. "If you see something, say something," he says of this philosophy. The Buffalo Soldiers Heritage Association has put in thousands of dollars of work into the barn, installing new office floors, expanding the stable's stalls, landscaping, and repairing fences. Elroy Reese cuts an apple.Sally Petrella, President of the Friends of Rouge Park, sees the group as indispensable to the success of the park. "Their work there has even led to the state funding the much-needed repair of the barn roof," Petrella said in a written statement. "We assisted the Buffalo Soldiers in coming to Rouge Park and continue to partner on many cleanups and events. 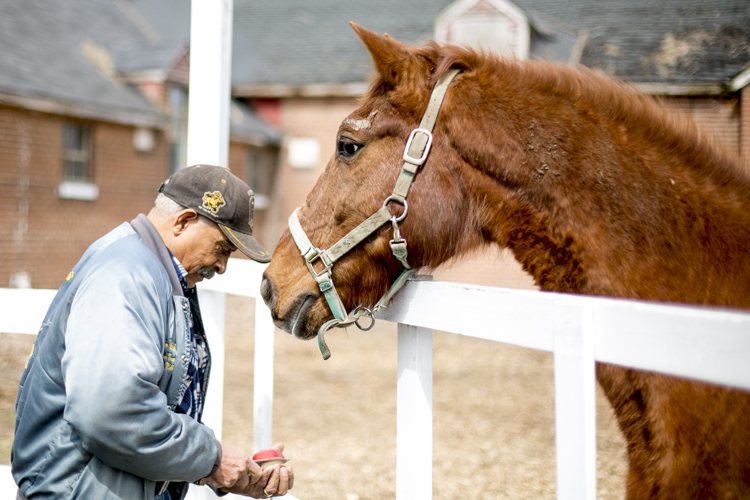 We see them and their horses as an essential component of Detroit’s largest park." The Buffalo Soldiers served the U.S. military for eight decades. Today the BSHA keeps their heritage alive through a different kind of service, educating and working with the public on Detroit’s west side. The Buffalo Solidiers Heritage Center at Rouge Park in Detroit is open seven days a week from noon to 4 p.m. as weather permits. All photos by Anthony Lanzilote.